In the XVIIIth century the European leading country in artistic and more broadly cultural matters was undoubtedly France. A symbol of this change of leadership from Rome to Paris can be seen in Gian Lorenzo Bernini's 1665 journey to Paris: he had been called there by King Louis XIV who wanted him to design the main façade of the great carrè du Louvre of which three sides had already been completed. It was an offer Bernini, then aged 67, could not refuse: relationships between the young and ambitious King of France and Pope Alexander VII had been very tense: after the 1661 death of Cardinal Mazzarino who had oversight over the government of the country during his minor age, Louis XIV concentrated all powers in his hands and soon made clear to the pope he was in no mood to participate in a Catholic crusade against the Ottomans, whom he saw as a strategic ally in curbing the power of the Habsburgs. He took advantage of a minor fight between groups of papal and French guards near Palazzo Farnese, then the residence of the French ambassador, which had caused the death of a French page. The papal government apologized for the incident, but King Louis XIV recalled his ambassador and in retaliation occupied Avignon and the other papal possessions in France. Pope Alexander VII regained Avignon only after accepting the humiliating terms of the 1664 Peace of Paris, which included the erection in Rome of a monument with an inscription apologizing for the killing of the page (it does not exist any longer). The invitation to Paris seemed an occasion to improve relations which could not be missed. Bernini was very well received; among those who felt honoured to meet him and to have the opportunity to eye his plans there was a young architect who was to play a great role in the artistic development of his country: Christopher Wren. Bernini had already proposed two projects for the Louvre façade and while in Paris he developed a third one and once back in Rome he further modified it to take into accounts comments from French architects and of Jean Baptiste Colbert, powerful minister of the king. During his stay in Paris, Bernini had to show also his skills as a sculptor: he designed an equestrian statue of Louis XIV portrayed as a Roman emperor: Bernini left indications that the statue should be located on a high ground. Bernini returned to Rome just to learn soon after that the king's interest for the Louvre was fading as he now was keener on developing his new residence in Versailles: the Bernini project for the Louvre was shelved, his equestrian statue ended up in the gardens of Versailles and was regarded as portraying Marco Curzio, a mythological hero of ancient Rome. Beyond the specific circumstances of the poor appreciation of Bernini's works, the desire of the king and of his minister to promote French architects and artists was very evident: other initiatives went in the same direction: in 1666 King Louis XIV founded in Rome the French Academy where young French artists were sent to study the monuments of ancient Rome and then return to France. A few years later he ordered two plaster casts of the reliefs of Colonna Traiana, one for the students of the academy in Rome and one to be brought to Paris again for study reasons: before Louis XIV several French artists had set their residence in Rome: in particular the great painters Claude Lorrain (it. il Lorenese) and Nicolas Poussin (it. Pussino). Strong economic reasons were behind the decline of Rome and the growth of Paris: the popes had drained all the resources of their state to pour them into the embellishment of Rome: Pope Alexander VII left to his successors a very difficult financial situation which led to a dramatic containment of all expenditures. Louis XIV was starting in Versailles a similar cycle of great investments, the cost of which his successors had eventually to bear. Notwithstanding this, Vienna continued in general to prefer Italian artists: there was a long tradition of cultural exchanges between Austria and Italy, but there were also political reasons behind it: the state of almost continuous war with France and Louis XIV's hand behind the Ottoman siege of Vienna made France very unpopular. 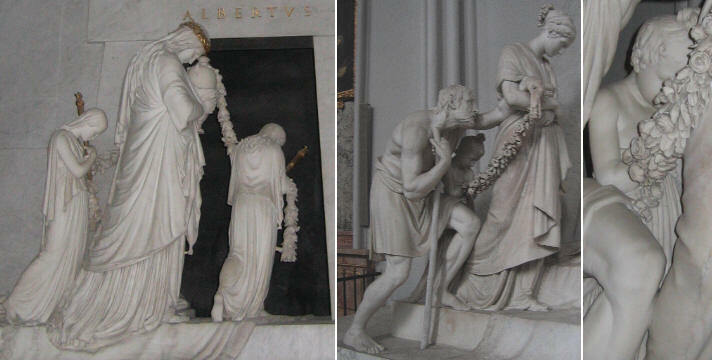 In general there are not many funerary monuments in Vienna and even in the Capuchins's crypt, where the bodies of the emperors are buried (their hearts similarly to what happened to those of the popes, are kept in another church), most monuments are very simple. The few which have a complex decoration show the influence of Italian patterns in some gruesome reminders of death and in the use of medallions to portray the dead. Also in the choice of subjects the Italian influence is very evident: many statues in the XVIIIth century Belvedere gardens have references to famous Roman statues, although in the case of Apollo and Dafne the dramatic tension of Bernini's masterpiece is entirely lost (the image used as a background for this page shows a detail of that statue). Some iconographic patterns set by Bernini were followed even in the XIXth century statues of the Ring gardens. Melodrama was a field of art where Italians had still the leadership: Bernini was also a scenery designer and he was occasionally asked to organize celebrations and parties; Filippo Juvarra, who spent his early career in Rome, because of the lack of commissions in XVIIIth century Rome, earned his living as a scenery designer for the private theatre of the Ottoboni. In Vienna for almost half a century an Italian, Ludovico Burnacini was in charge of staging melodramas and organizing imperial entertainments. Portait of Pietro Metastasio and scenery for "Angelica vincitrice su Alcina"
Walche (Italian) was widely spoken in XVIIIth century Vienna (to learn more about this word see an Italian street in Prague) and Italian artists did not need to learn German to live and work there. The instructions Burnacini gave for the staging of melodramas were written in Italian and the melodramas themselves were sung in Italian. Pietro Metastasio was one of the greatest Italian poets of the XVIIIth century; he was appointed Caesarean Poet by Emperor Charles VI in 1730 and for the rest of his long life (he died in 1782) he wrote poems and librettos for the delight of the imperial court, all in Italian. A page on Italian sculpture in Vienna cannot omit a masterpiece by Antonio Canova. In 1798 Canova was commissioned a monument to Archduchess Maria Christina, a daughter of Empress Maria Theresa, married to Duke Albert von Sachsen Teschen. Canova had developed some ideas based on using a pyramid as the focal point in a monument dedicated to the great Venetian painter Titian, which was never built. Bernini, in Cappella Chigi in S. Maria del Popolo, following original sketches by Raphael, had designed monuments where the portrait of the dead, inscribed in a medallion, was placed on a pyramidal shape and he set a pattern for several other monuments. Canova replaced the symbolic pyramidal shape with an actual pyramid, seen as the most ancient funerary monument and, disregarding historical evidence which said that the pharaohs made all efforts to hide the narrow corridor leading to their tombs, he designed an open door leading to the interior of the pyramid. Above the entrance he wrote a simple inscription praising the dead, whose portrait was traditionally placed towards the top of the monument. To the right of the entrance Canova placed two statues which had given him glory, the naked angel and the sleeping lion of his 1792 monument to Pope Clement XIII. Overall these features of the monument were not terribly new. During the first French occupation of Vienna in November 1805, Napoleon was so impressed by this monument that he immediately decided to request the services of Canova; what kept him half an hour in Augustinerkirche was the procession of six characters who from the far left move towards the entrance, as if unable to escape being attracted by that fatal threshold: the young girl leading the group is almost inside, her face already swallowed up by darkness. The first three characters represent Virtue and her maids, the last three are a metaphor of Charity, but we see in them more than their traditional iconographic meaning: Charity for example can as well be regarded as a portrayal of the three ages of man (young/adult/old) to say that death looms regardless of age. Canova was a dal vero (from the actual thing) sculptor and his old man has the weak body structure and muscles of that age, while before him artists mainly followed patterns which placed white haired heads on a gladiator's body.